TheVeganKind first introduced me to and made me love Quinoa, so seeing Quinola Mothergrain in another box was delightful but this one was the Quinola Kids but whatever is great for kids is also suitable for adults and it's described as a quick on the go meal for adults too. Quinola Mothergrain are all gluten free, organic and full of slow releasing carbs. You also get protein with iron and fibre. Ideal meal to have before the gym! Mediterranean Quinoa with tomato, courgette & carrot, Thai Quinoa with peas, carrots & coconut milk or Tex Mex with kidney beans, sweetcorn & tomato (which is dinner later). These are available to buy for £1.99 per packet. Whoa! 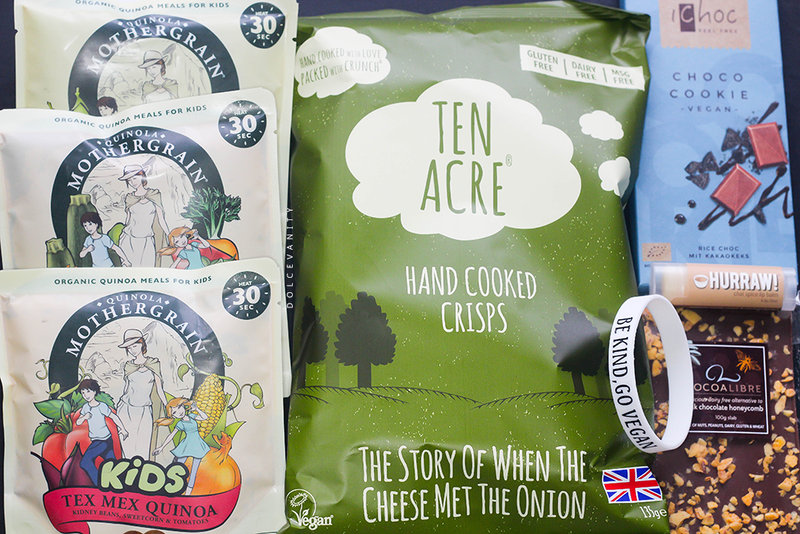 Ten Acre Crisps - The Story of When the Cheese Met the Onion are in a giant packaging. I love their cheese & onion crisps, they taste like no other brands, very fresh and raw tasting & without the cruelty you are still getting a good old nation favourite crisp flavour...in a large packet! iChoc Choco Cookie Vegan Milk Chocolate Bar very sharp crispy, creamy vegan milk chocolate bar, one that does leave the taste buds buzzing. It's got little chunks of oreo style cookies within the chocolate bar, which gives the sharp cocoa taste I feel that comes through the main chocolate a subtle counteract balance. Cocoa Libre Milk Chocolate Alternative Honeycomb Slab simply mouth wateringly, crunchy and indulgent. I can't say much else. Rice milk chocolate honeycomb on a chunky slab. Not an easy one to break and share *wink* These bars do not contain wheat, nuts, peanuts, dairy or gluten they are completely free of traces of these products, suitable for vegans due to the zero honey content & coeliacs. When I saw the Hurraw! Chai Spice Lip Balm, it reminded me I haven't had chai in quite a while. It's got that spice smell, oft and lightly moisturising. I noticed it has black pepper, cinnamon, clove and vanilla within the ingredients for the blend and two of those I use as a plump for my lips - yes I know, my lips don't need to be any more plumper but hey! 2 years ago, when we just launched TVK and our first boxes (only about 200 of them in the first month!) were packed in our kitchen and living room... !! !